It can be argued that sovereign risk refers to ‘black swan’ events as characterised in Taleb (2008), rare and extreme events with retrospective (though not prospective) predictability. In addition since banking risk is intrinsically linked to sovereign risks, it can also be denoted as a ‘white elephant’ type of risk, i.e. a risk that although it has the potential to be costly, it is also difficult, if not impossible, to dispose of. While both views have some wisdom, the truth probably lies in between. Sovereign risk has for long been highlighted as an issue, but perceived as unlikely to crystallise in Europe and too difficult to address effectively, given the strong interlinkages between governments, monetary policy and banking systems. Nonetheless, the current preferential treatment of sovereign risk in the banking regulatory framework was clearly challenged during the financial crisis. The lack of risk sensitivity and incentives in the prudential framework to manage sovereign risk actively may have led to complacency prior to the EU sovereign debt crisis, as empirical evidence illustrates limited diversification and significant home-bias in the holdings of sovereign assets. Consequently, increased reliance on mark-to-market valuations of sovereign exposures, standardised disclosure and regulatory incentives to diversify sovereign risk would lead to a more robust framework that, although it may not eliminate the risk of sovereign black swan events, will mitigate the impact and hopefully make the white elephant smaller. The banking regulatory reforms initiated as a result of the financial crisis are drawing to an end. The Basel Committee of Banking Supervision (BCBS) has committed to close the remaining regulatory proposals by the end of 2016. While it will still take time to implement the reforms, banking regulation will have been substantially reshaped taking into account the lessons learned from the financial crisis. There is, however, one notable exception: sovereign risk. As the BCBS itself puts it: “the Committee has initiated a review of the existing regulatory treatment of sovereign risk and will consider potential policy options” in “a careful, holistic and gradual manner”.1)See BCBS work programme at http://www.bis.org/bcbs/about/work_programme.htm Hence, as it currently stands, sovereign debt will see its preferential regulatory treatment in the prudential framework untouched, even strengthened in some aspects, with reforms and revisions only being introduced gradually and over a longer time horizon. The BCBS has rightly identified sovereign risk as a type of risk that deserves careful consideration. The crisis illustrated that banks’ sovereign exposures can be subject to losses, as was observed with the haircut imposed on international creditors in the Greek debt-restructuring deal in 2012; soon after that, in 2013, according to the European Stability Mechanism (ESM) Treaty, collective action clauses (CACs) became mandatory for all new euro area government securities with maturity above 1 year, giving wider possibilities for restructuring. Most importantly, the European sovereign debt crisis exposed systemic risk that can arise from banks’ home-bias in their sovereign investments, i.e. an excessive concentration of banks’ exposures towards their domestic sovereign. The adverse bank-sovereign loop transmitted turbulence in sovereign debt markets directly into bank funding markets and lending conditions to the real economy, breaking down the Single Market for banking services along national lines. Hence sovereign defaults have the potential to be black swan events, see Taleb (2008), i.e. rare events with extreme impact and some element of unpredictability that prevents efforts to limit the risk before it happens. Despite the potential impact of sovereign exposures, the current capital regulation still applies a wide-ranging preferential treatment of sovereign exposures. One of the reasons behind the current unchanged situation is what we call the ‘white elephant’ issue.2)According to Merriam-Webster, a white elephant is “something that requires a lot of care and money and that gives little profit or enjoyment”. The argument runs as follows: a sovereign default can be very costly, but it is an event that happens so rarely and is very difficult, if not impossible, to remove given the magnitude and necessity of sovereign exposures in the banking system – especially for liquidity management. It is hence a risk that if fully covered – and that is what matters most from a regulatory perspective – would lead to disproportionately high requirements and a disruptive impact on both banks’ balance sheets and sovereign debt markets. Given that it is not possible to solve this issue, it is then argued that the risk must be accepted and limited tools are available to address it. According to this line of reasoning, the issue of sovereign risk is so pervasive and rare that it cannot be addressed properly – hence better to accept this conclusion and avoid any regulatory reform. To some extent we sympathise with the logic behind this argument, especially the fact that fully addressing the issue would have wide-ranging repercussions, and hence understand the subject needs to be treated with great caution. However, one should also be aware that the status quo is not tenable in light of the recent experience: despite the white elephant is likely to always linger in the background and capital set aside for this risk is likely to be insufficient to fully cover default events, the behavioural incentives introduced by the preferential treatment granted to sovereign exposures in our view exacerbated the problems observed in the financial crisis. This incentive issue can and must be mitigated. We will therefore argue in this article that a gradual introduction of more risk sensitive metrics is the right way to go in order to remove this deficiency in the prudential framework. The preferential treatment of sovereign exposures is particularly relevant in the credit risk framework, where two elements should be highlighted. First, international standards allow banks’ exposures to the domestic sovereign denominated in local currency to be considered risk-free, i.e. they are subject to a zero risk weight in the capital requirements calculation under the standardised approach (SA). In the EU legislation this preferential treatment is extended to exposures towards any of the 28 Member States, even in presence of a currency mismatch. The internal ratings-based (IRB) approach introduces non-zero risk weights, but at the cost of significant – and difficult to justify – variation in capital requirements across banks, as shown in EBA (2013a). Second, sovereign exposures are granted a full exemption from requirements limiting concentration risk in the EU, i.e. the large exposures framework. All in all, limited measures are in place to cover for sovereign risk in the current regulatory framework for credit risk. Among the preferential treatment of sovereign risk in the prudential framework, the zero risk weighting has probably received most criticism – see for instance Nouy (2012) and ESRB (2015). While there is merit in these observations, implementing an alternative framework for sovereign risk does not come without complications, especially considering the need to ensure consistency with other elements of the regulatory framework. In particular, the interaction with the liquidity regulation, which requires banks to hold significant amounts of sovereign securities as a buffer to withstand funding shocks, will have to be carefully considered. The main objective should be to prevent excessive concentration risk towards a specific sovereign issuer, which for banks almost always is the domestic sovereign. Furthermore, banks should be induced to manage their sovereign risk actively and a non-zero risk weight may not be sufficient to incentivise such behaviour. We argue that more attention needs to be paid to the allocation of sovereign exposures to different accounting books; in particular, regulators should ensure that a significant portion of bank sovereign holdings are valued according to market prices, especially to the extent sovereign securities are held to meet short term liquidity requirements. This, in combination with a framework that addresses excessive concentration risks and a standardised disclosure framework, will provide positive incentives for an active risk management of sovereign positions. This paper is structured in three sections. Firstly, it looks at the lessons learned and importantly the regulatory measures taken during the European sovereign debt crisis, which illustrate the concerns about the current framework. Secondly, a selective overview of the current regulatory framework – focusing on the rules pertaining to liquidity risk, credit risk and large exposures – is provided. Finally, we argue for the development of a more risk-sensitive framework which provides sounder incentives for banks to manage their sovereign risk more actively. The outbreak of the European sovereign debt crisis in 2011 exacerbated the market turmoil and increased the concerns about the already fragile balance sheets of European banks. As sovereign spreads in several Member States widened, banks in those countries became under significant pressure: investors started assessing banks’ resilience on the basis of the credit standing of the sovereign providing them with an implicit safety net; also, as market analysts and investors increasingly focused on banks’ holdings of sovereign debt, the lack of reliable and comparable information on actual exposures and on their valuations in the bank’s books allowed significant concerns and market uncertainty to take root. The timeline of the crisis is described elsewhere – see for instance Lane (2012) for an overview. We will thus not focus here on the activation of assistance programmes and on the emergency measures to address the fiscal aspects of the crisis. Rather, we will look back at the events that had an impact on the performance of EU-wide regulatory and supervisory tasks under the EBA’s mandate, as this could hopefully provide useful insights into the debate on the regulatory treatment of sovereign exposures. During the spring of 2011 the Greek sovereign crisis took a turn for the worse while the EBA, established few months before, was running its first stress test on a significant sample of EU banks. Markets were very uncertain about the size and market value of banks’ exposures to Greek sovereign debt, as well as towards other Member States whose sovereign spreads were widening, in particular Portugal, Ireland, Italy and Spain. The issue of the treatment of sovereign exposures in the stress test was extensively discussed at the EBA Board. On the one hand, it was difficult for the EBA to apply any other treatment than the one envisaged in the rulebook. Also, it was not easy for a regulator to introduce capital charges to cover for credit risk, while the EU had just set up a facility at the European Financial Stability Fund (EFSF) to prevent the default of any Member State. At the same time, the preliminary results of the stress test raised serious questions of consistency and reliability in the treatment of sovereign exposures. More than half of the banks in the sample used internal models to assign risk weights to their sovereign portfolio. It was apparent that the higher the exposures towards sovereigns under stress, the lower the banks’ estimates of risk parameters and, therefore, the lower the risk weights and the capital charges. The latter were significantly different from zero (and sometimes very high) only in cases in which the exposures towards that specific sovereign were not material. In order to address this issue, the EBA Board of Supervisors agreed after very controversial discussions to introduce floors to the loan loss provisions for sovereign exposures in the stress test. The floor was defined on the basis of a methodology that extrapolated risk parameters from information contained in external ratings for the corporate sector. As a result, the capital impact in the stress test for an exposure towards the Greek sovereign, for instance, was at least 17% of the nominal value of that exposure. Also, the EBA decided to give full and very granular disclosure of information on individual banks’ exposures to each sovereign.3)See http://www.eba.europa.eu/risk-analysis-and-data/eu-wide-stress-testing/2011 A few months later, one week after the results of the stress test were published, the ECOFIN Council agreed on private sector involvement (PSI) in the restructuring of Greece. As a result, banks had to agree to a 20% haircut of their exposure – not so far away from the EBA’s preliminary estimates. However, it was immediately clear that market participants were not satisfied with the treatment the EBA applied in the stress test. They wanted to see sovereign exposures fully written down to reflect the prevailing market values. Using the very granular information provided by the EBA, analysts calculated the capital position of each bank participating in the stress test when all sovereign exposures were valued at market prices. The first casualty was Dexia, which had shown a robust capital position in the stress test, but had significant exposures to sovereigns and municipalities in stressed countries. According to some calculations, once such exposures was revised to reflect market valuations, the stressed capital ratio of the bank once such exposures was barely positive, at 0.5%. The bank started experiencing difficulties in accessing market funding and the liquidity problems led very fast to a crisis that quickly drove the bank into resolution. The EBA paid a significant price in terms of reputation, as the crisis of Dexia was widely interpreted as a failure of the stress test. However, we could argue that the disclosure provided by the EBA allowed market discipline to exercise fully its effects and was instrumental to addressing the problems of Dexia’s business model in the run-up to sovereign debt crisis. Nonetheless, this sequence of events made the EBA very alert to the worrisome link between stressed sovereign exposures and access to market funding. The sovereign debt crisis was rapidly turning into a funding market squeeze for European banks, not only in stressed countries. As a significant amount of bank liabilities was reaching maturity, banks grew increasingly concerned and started to disorderly deleverage. The EU was facing a very high probability of an imminent credit crunch, which would have further aggravated the crisis. EBA staff quickly realised that the regulatory response had to include capital buffers against sovereign risk, as well as public support to bank funding. This is the background of the EBA’s policy proposals in autumn 2011: a requirement to significantly strengthen banks’ capital positions on the basis of the market valuations of sovereign exposures, and the introduction of EU guarantees on newly issued bank liabilities. The EBA issued the recommendation asking banks to raise their risk-weighted Core Tier 1 capital ratio to 9%, including a sovereign buffer that was designed to capture the effect of the depressed market valuations of government debt on the banks’ capital position.4)See http://www.eba.europa.eu/-/the-eba-details-the-eu-measures-to-restore-confidence-in-the-banking-sector De facto, the requirement was equivalent to imposing a one-off adjustment of valuations to reflect market prices at the peak of the crisis. In particular, banks were required to remove the so-called prudential filters on sovereign assets in the Available-for-Sale (AfS) portfolio and prudent valuation of sovereign debt in the Held-to-Maturity (HtM) and Loans and receivables (L&R) portfolios, in order to reflect current market prices. Effectively both measures aimed at providing market valuation of the sovereign exposures. This choice was also necessary in light of the very diverse allocation of sovereign exposures in accounting books across the banks covered in our recommendation – in some cases more than 90% of the sovereign portfolio was classified in the HtM and L&R books and carried risk weights close or equal to zero, so the recommendation would have been completely ineffective without a specific requirement reflecting market valuations. Furthermore, the mark-to-market component of the recommendation was essential to put all banks on the same footing, irrespective of their choices as to the allocation of sovereign exposures to different accounting books. The EBA recommendation was subject to some criticism for being procyclical and penalising countries under stress. In particular, some argued that it would have led to a significant deleveraging, even to the very credit crunch that it tried to avoid, and that it would have led to a sell-off of sovereign debt in stressed countries. However, it accomplished its objective: banks’ capital positions were significantly strengthened – the shortfall originally identified was EUR 115 billion, the final increase in the banks’ capital positions was in excess of EUR 200 billion; the requirement did not allow banks to comply by reducing risk weighted assets and thus did not lead to any disorderly deleveraging; banks in countries under stress did not reduce their investment in domestic sovereign – on the contrary, as the recommendation was calibrated on the sovereign holdings at the end of September 2011, they significantly expanded the exposures to their domestic sovereign. The EBA’s concurrent proposal to introduce EU guarantees on newly issued bank debt was not supported by the ECOFIN Council. This was very disappointing, as the proposal had been carefully designed to avoid any mutualisation. The guarantees would have been issued by a EU vehicle and, from an investor perspective, it would have been backed by all Member States. This EU-wide scope of the guarantee was essential to cut the link between individual sovereigns and bank liabilities. But at the same time, an inter-guarantor agreement would have determined the allocation of losses, so that each Member State would have covered the losses generated by the banks under its jurisdiction. At the time, EBA staff was unsure whether to push ahead with the recapitalisation requirement in the absence of the guarantee on the liabilities, as the two elements were essential to address the funding squeeze being experienced by banks and avoid a credit crunch. With hindsight, the decision to proceed with the capital recommendation was the right one, as the ECB soon launched the first Long Term Refinancing Operations (LTROs), thus providing the necessary access to funding. The recapitalisation exercise was the first European attempt to require market valuation of sovereign assets, but the exercise was not only focused on capital. Equally important was the objective to further enhance transparency about the actual size of sovereign exposures and the valuations used by banks. The in-depth, very granular disclosure of data was an essential element of the policy action aimed to restore confidence in the EU banking sector and dispel the uncertainty about the level and pricing of sovereign holdings. Hence the stress test results from July 2011 were accompanied by detailed disclosure of the sovereign holdings and the October capital exercise provided clarity on the bank-level accounting treatments of sovereign assets. The disclosure of the actual level of exposures was consequently an equally important goal of the overall exercise. Fast-forwarding to the situation today, a significant home bias seems to remain a key feature of EU banks’ holdings of sovereign debt. Figure 1 shows net direct holdings of domestic sovereign exposures as a share of net direct holdings of total (i.e. domestic and non-domestic) sovereign exposures. The home bias in the sovereign portfolio of EU banks is apparent. The information is based on the latest EBA transparency exercise, which covers on the largest 105 banking groups in the EU. As these players are typically more geographically diversified than smaller banks, the data probably represent a lower bound of the home-bias behaviour of EU banks. Note: Measure used is net direct holdings. It is generally difficult to identify any significant country trends. A lower home-bias seems to prevail in Member States with low government debt-to-GDP ratios5)2015 data from Eurostat. See http://ec.europa.eu/eurostat/tgm/table.do?tab=table&init=1&language=en&pcode=teina225&plugin=1, i.e. with limited sovereign issuance (such as Latvia, Luxembourg and Sweden – all with government debt-to-GDP ratios below 45%), although this is not always the case. A limited home-bias is shown by banks in Finland and the Netherlands, which have government debt-to-GDP ratios in excess of 60%, while higher home-bias is visible in Norway, which has one of the lowest debt-to-GDP ratios in the EU, at 31.6%. Similarly it is difficult to identify a clear pattern between euro area and non-euro area countries, contrary to the expectation that the home bias should be lower within the euro area, where banks may invest in several sovereigns without any need to engage in currency hedging strategies. 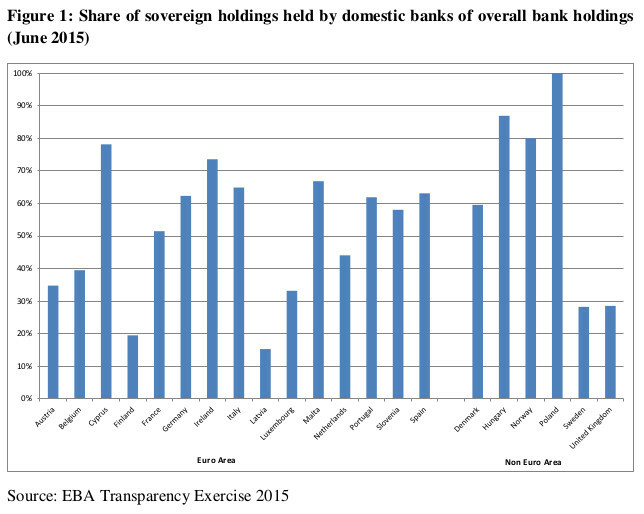 It is however clear that on average at least half of the sovereign holdings of EU banks are towards the home government. The bank-sovereign link within Member States remains very strong. Note: Measure used for bank exposures is gross direct long exposures. 4 banks with overall sovereign exposures exceeding 1000% are not included. From the prudential point of view, the home bias translates into excessive concentration risk. Figure 2 shows that domestic sovereign exposures are on average equal to 100% of Tier 1 capital in our sample of 105 banks under consideration – and the figure moves closer to 200% for smaller banks in the sample; 36 banks have exposures in excess of 200% of their Tier 1 capital, 11 banks are above 400%. Although some reluctance to diversify into non-domestic holdings may be understandable, the very high level of concentration observed is a source of concern for supervisors and represents direct channel for contagion in case of turbulence in sovereign debt markets. Note: Measure used is net direct holdings according to accounting classification. More specifically, according to IAS 39, financial securities have to be classified into four categories: i) Financial assets at fair value through profit or loss (FVPL) – this category relies on fair value and has two sub-categories, which are used in the above chart, which are respectively Held for Trading (HfT) and Fair Value Option (FVO), 2) Available-for-sale financial assets (AfS) – this category relies on fair value, 3) Held-to-maturity investments (HtM) – this category relies on amortised cost and 4) Loans and receivables (L&R), which relies on amortised cost. As discussed above, the valuation methods used for sovereign exposures are also important. The market uncertainty surrounding both the magnitude and the valuation of sovereign exposures represented one of the main drivers of market turmoil. There is a wide diversity in practices across banks and countries, reflecting also the lack of regulatory guidance. Large parts of sovereign exposures are still kept in accounting books (HtM and L&R) that rely on valuation at amortised cost, rather than at fair value. This implies that swings in market prices are not reflected in the bank balance sheets and in measures of capital adequacy. Should a bank need to dispose some of its sovereign holdings during a phase of falling prices, in order to for instance address a short-term liquidity stress, regulatory capital would not be have been set aside to absorb these losses. Figure 3 illustrates the current valuation practices. The reliance on amortised costs is still widespread today for sovereign exposures. 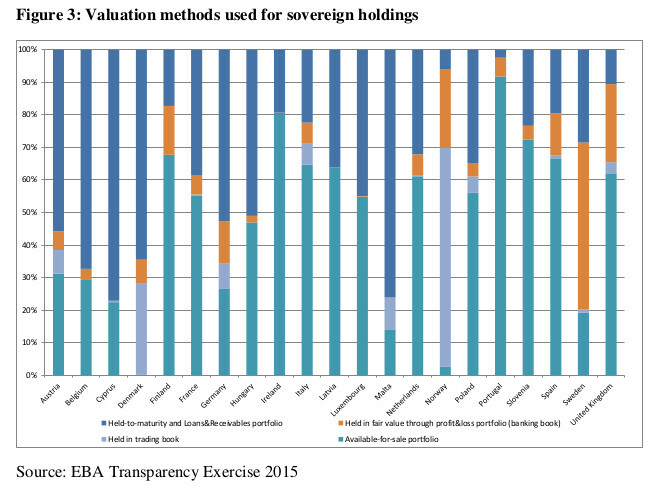 While there is some evidence that banks have shifted towards a greater reliance on fair value for sovereign exposures, a significant and in some countries predominant share of holdings is still classified in the HtM and L&R categories. This is difficult to justify when a large share the very same sovereign assets is used to comply with the newly introduced liquidity requirements. In fact, in order to comply with the liquidity coverage ratio banks are required to establish large buffers of high quality liquid assets, including sovereign holdings, to withstand a liquidity stress for a period of at least one month. Hence, banks are expected to be ready to promptly sell these assets at the prevailing market price in case of a liquidity shock, a condition that does not seem compatible with valuations at amortised cost. Therefore as a minimum sovereign assets used to fulfil the LCR requirements should always be measured at fair value, also for accounting purposes. The sovereign buffer based on market valuations that the EBA introduced in 2011 was a one-off measure and has not become a permanent feature of the regulatory framework. Also, no specific requirements are now in force to ensure adequate and regular disclosure of information on sovereign exposures, although the EBA has continued to make available detailed data on sovereign exposures, in a standardised format, at least once a year for the largest banks. Concentration risk towards sovereign exposures is also not addressed in the current regulatory framework. Summing up, these are main takeaways from an EBA perspective of the recent experience: (i) sovereign risk may be a significant source of disruptions for banks and is not adequately covered in the current regulatory framework; (ii) calibrating a capital charge is challenging, because of the ”white elephant” and lumpy nature of sovereign risk – in normal times nobody notices it, in times of stress no capital charge seems to adequately reflect the rapidly changing perception of risk and it becomes highly costly; (iii) although some home bias in the composition of the sovereign portfolio is probably unavoidable, the regulatory treatment should embody some disincentives to excessive concentration of exposures; (iv) any regulatory treatment cannot ignore valuation, i.e. how changes in market values are reflected in banks’ balance sheets and in their capital position; and (v) transparency has to be part of the solution – detailed information on sovereign exposures should regularly be made available to market participants in order to allow market discipline to play its role. The purpose of this section is not to give a complete overview of the regulatory framework and of the preferential treatment it grants to sovereign exposures – a thorough description can be found in ESRB (2015). We would like to focus our attention on three aspects, namely the treatment of sovereigns in the regulatory framework for liquidity risk, large exposures and credit risk. A harmonised regulatory framework for liquidity risk has been introduced in the EU for the first time in response to the crisis, implementing the international standards developed by the BCBS. The regulatory reforms focused on two issues: first, the lack of sufficient buffers of liquid assets allowing banks to survive long enough to design viable solutions to the crisis – a shortcoming that made government bail-outs the only available option for policy makers; second, structural imbalances in business models, with significant mismatches between the liquidity features of assets and liabilities – a problem epitomised by the failure of Northern Rock, see Shin (2009), which relied on securitisation and volatile wholesale funding to finance its long term mortgage business. In response to these concerns, the new prudential framework introduced two liquidity metrics in the prudential framework, namely the Liquidity Coverage Ratio (LCR) and the Net Stable Funding Ratio (NSFR) requirements. Whereas the NSFR focuses on structural aspects of the bank business model, the LCR6)See for instance EBA (2013b) and EBA (2015) for a description and impact assessment of the LCR metric. is a short-term measure that requires banks to keep in place a liquidity buffer to cover outflows under a pre-defined stressed 30-day scenario. At least 60% of the liquidity to fulfil the LCR requirements must be held in so-called Level 1 assets, i.e. liquid assets of the highest quality. In particular, only central government exposures, other exposures towards (or guaranteed by) public entities, such as central banks, regional governments, government development banks and high quality covered bonds qualify as Level 1 assets. Hence, the current regulatory framework recognises the high liquidity of debt issued by governments and other public administrations and de facto requires banks to hold a significant amount of sovereign bonds. In order to maintain a consistent framework, any changes to the requirements for sovereign exposures will need to keep this regulatory interaction in mind. It is also interesting to notice that in order to comply with the requirement, banks have to use the market value of their liquid assets, subject to a haircut to adjust for price volatility and liquidation costs. Again, in recognition of the high liquidity of sovereign debt markets, no haircuts are included on sovereign exposures. The large exposures framework is set in place in order to prevent banks from building up excessive concentration of their exposures towards a single counterparty. Specifically, a large exposure is defined with reference to any client or group of connected clients, where the value of the exposure exceeds 10% of eligible capital. Eligible capital comprises of Tier 1 and Tier 2 capital, but the latter can be computed only up to one third of Tier 1 capital. Any lending to a client or group of connected clients above 25% of eligible capital or EUR 150 million is prohibited. These rules are consequently intended to prevent the bank’s solvency to be put into jeopardy as a result of a default of a single counterparty. There is however a provision explicitly exempting sovereign exposures from the large exposures regime. Given the central role sovereign assets play in liquidity management, and also in light of the LCR requirement, there is surely logic to this exemption. Nonetheless, the lack of any requirements on concentration risk in the sovereign portfolio – in combination with the preferential treatment for credit risk – implies the absence of any regulatory incentives for banks to actively manage the concentration risk of their sovereign exposures. Finally, the regulatory framework for credit risk has traditionally embodied a preferential treatment for sovereign exposures. The original Basel Accord (1988), now better known as Basel I, introduced standardised risk weights for sovereign exposures, which were calibrated at a lower level for developed countries (as proxied by participation in the OECD). Most importantly, Basel I introduced discretion for national supervisors to apply zero risk weights for domestic sovereign exposures denominated in national currency. While the origins and reasons behind this approach has to our knowledge never been articulated clearly7)The Capital Accord of July 1988, later known as Basel I, has a number of careful considerations on the matter, but does not clearly articulate the rationale for a zero risk weight, just noting that “individual supervisory authorities should be free to apply either a zero or a low weight to claims on governments”., it is reasonable to assume that the origin of the zero risk weight is to be found in the fundamental role sovereign securities play in monetary policy operations – a role which has evolved through time, but has remained central for a long time across all relevant jurisdictions. In turn, this determined the key function sovereign paper plays in money markets and for liquidity management at financial institutions. As long as central banks through their monetary policy operations were willing to act as a backstop and at the same time co-existed together with predominantly domestic banking systems, the preferential treatment given to domestic sovereigns appeared well-founded. Looking at today’s setting for monetary policy operations, it is however clear that the old arguments are less robust, given that sovereign assets are no longer automatically converted into cash. The use of Value-at-Risk considerations influenced central banks and lead to the introduction of differentiated haircuts on assets received as collateral. For instance, the Eurosystem applies haircuts to the sovereign collateral posted by banks to access central bank liquidity. The haircuts reflect the credit standing of the issuers and are based on external ratings, but appear calibrated to reflect market risk, i.e. the risk for the Eurosystem of having to sell those exposures and bear losses, in the short term, due to adverse price movements. The regulatory framework also evolved in response to developments in risk management techniques, as supervisors wanted – correctly in our view – to move to a more risk-sensitive approach, providing banks with incentives to improve their ability to measure and actively manage risks. The regulatory paradigm moved towards allowing banks to rely on their internal models to determine regulatory capital requirements, first for market risk and then, with the so-called Basel II framework, also for credit and operational risk. Banks were consequently expected to move towards modelling of all portfolios, including sovereign portfolios. This solution was expected to address the lack of a risk-sensitive treatment of sovereign exposures. Basel II however retained the national discretion of a zero risk weight, which was expected to be used by smaller credit institutions, which would not develop internal models. However, in the EU implementation of Basel II banks were allowed to adopt internal models while keeping the standardised approach (SA) for some portfolios – the so-called permanent partial use (PPU). This deviation from the Basel standards allowed many banks, with supervisory approval, to continue applying a zero risk weight on the sovereign portfolio, while internal models were used for other exposures. The PPU for sovereign exposures was part of the BCBS’s assessment of the EU as materially non-compliant with the international standards on capital, see BCBS (2014). The benefits of the internal modelling approach however never materialised for sovereign exposures. The limited number of sovereigns and the even lower amount of loss and default observations made it very difficult to develop robust models. The risk weights calculated with banks’ internal models led to a wide dispersion of results (EBA, 2013a). In the absence of data, IRB models typically rely on a substantial amount of judgement and biases may consequently be introduced – for instance a reluctance to set high risk weights for domestic sovereign exposures. Therefore the current regulatory framework embodies either a lack of risk sensitivity, as is the case for the zero risk weight under the SA, or a subjective assessment in the case of IRB models. The choice between SA and IRB also left supervisors with a dilemma: either accept the lack of regulatory capital backing sovereign exposures or rely on imperfect models. Also in the EU, supervisors followed different routes: in Sweden and Belgium, for instance, the competent authorities require banks to use IRB models for sovereign exposures; in most other Member States they chose to allow the use of the SA. Consequently no tools, except a specific supervisory assessment under the Pillar 2 framework, are available to ensure that capital to cover the sovereign risk is available. The BCBS has already signalled that the possibility to use IRB approaches for sovereign portfolios should be eliminated and is currently discussing possible improvements to the standardised approach. Overall, the conclusion that we draw is that the current regulatory framework provides banks with no incentives to actively monitor and manage sovereign risk. While the argument can be made that sovereign risk needs a specific treatment, that takes due account of the general low-risk nature of the instrument, its importance for liquidity management policies, in addition to the special role given to sovereigns in the monetary policy framework, the complete absence of requirements on the level and composition of sovereign exposures is difficult to justify. We are very much aware that changes to the regulatory treatment of sovereign exposures could lead to major adjustments in the banks’ balance sheets and to potentially significant impact on still fragile European sovereign debt markets. It is clear that in some sense sovereign risk will always remain a white elephant, which is difficult to fully protect against. Hence any reform will have to be carefully designed and gradually implemented. The arguments developed in the previous sections however also lead us to the conclusions that a new regime should be built around few basic principles, which should aim at providing the right behavioural incentives to manage sovereign risk and thereby possibly even contain the impact of sovereign black swan events in the future. First, low but positive risk weights should be introduced for domestic sovereign exposures. This principle was already included in the original Basel Accord (BCBS, 1988), although it was never adopted, with most countries using the national discretion for zero risk weights. With Basel II it was followed by the largely unsuccessful move towards internal modelling. Low, non-zero, risk weights would force banks to more actively manage the risk in their sovereign exposures. As argued by Acharya and Steffen (2015), the lack of risk sensitive capital requirements was one of the drivers leading banks to hold riskier EU sovereign assets prior to the crisis. Introducing positive risk weights is consequently an important starting point, but probably not the most important change that is needed in the framework. In fact, we have to acknowledge that there is a need to have substantial sovereign exposures on the balance sheet of banks – not only for the purpose of liquidity buffers, but as part of monetary policy operations and collateral transactions. Sovereign securities represent an essential element in a variety of banking operations and, albeit not risk-free, they remain at least low-risk exposures with highly liquid markets. What is necessary is to give banks incentives to actively manage this risk and especially avoid excessive concentration of exposures towards the domestic sovereign. Some diversification of the sovereign portfolio is essential to alleviate the adverse bank-sovereign loop that we saw at play during the crisis. However, looking at the composition of bank balance sheets, as described in Figure 2, it is clear that rigid and conservative large exposure limits – e.g., the same 25% limit applicable to exposures to private counterparties – may have very disruptive consequences. Banks would be forced to conduct a massive reallocation of their sovereign holdings; they would not benefit from the flexibility needed to manage their portfolio of liquid assets and support their capital market activity; furthermore, tightly calibrated concentration limits would clash with the liquidity requirements. Rigid concentration limits would be particularly challenging for EU banks headquartered outside the euro area, as diversifying the sovereign portfolio would entail additional currency risk on a significant scale. Hence in our view the second ingredient of a workable policy solution would be to design capital requirements increasing with concentration risks, according to a metric compatible with the liquidity requirements. For instance, very low risk weights could be applied to domestic sovereign exposures below a threshold defined with reference to the average high quality liquid assets necessary to comply with the LCR requirements. 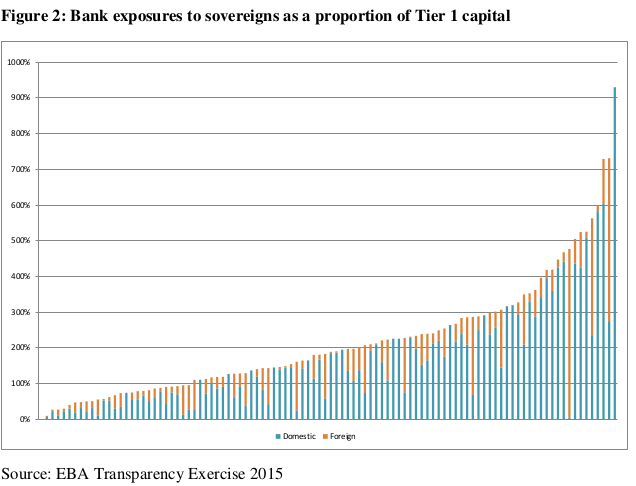 In order to give a very tentative order of magnitude, should a bank use solely a single-name sovereign exposure to fulfil the minimum required level 1 assets, this exposure would, according to internal EBA estimates, correspond to on average around 100% of Tier 1 capital. Then a gradual and increasingly steep increase in risk weight could be envisaged when concentration of exposures towards a sovereign rises above that threshold. With increasing capital requirements, banks would not be forced to diversify, but would become more resilient to potential disturbances in sovereign debt markets. The issue of excessive concentration risk could probably be successfully addressed also through other mechanisms. For instance, Brunnermeier et al (2011) proposed the use of securitisation structures to create liquid multi-country sovereign exposures, so-called European Safe Bonds (ESBies). Using an approach based on pooling of different sovereign exposures according to pre-defined rules, but without liability across countries, the problem of insufficient diversification would be directly addressed already at the issuance. As a matter of fact, regulatory disincentives to excessive concentration and diversified securitisation structures such as the ESBies could be part of a solution to address sovereign concentration risk, without generating excessive transitional adjustment challenges in sovereign debt markets and bank balance sheets. The third element of a workable regulatory reform should be the introduction of a requirement to include a significant portion of the sovereign portfolio in accounting books that entail mark-to-market valuations. As mentioned above, it would make sense to require that at least all the sovereign holdings that are considered to comply with the LCR requirements are included in the trading or the AfS accounting portfolios, as banks are expected to be ready to sell these assets at short notice in case of liquidity shocks. Today, the LCR requirements is computed on the basis of market values, but the securities could still be placed in the HtM or L&R books, so that changes in market prices would not have any impact on the banks’ capital. A greater reliance on mark-to-market valuations would provide a powerful incentive for banks to actively manage sovereign risk, while also addressing concerns that were the exclusive focus of market participants during periods of stress. Would market valuation of sovereign assets make capital requirements more pro-cyclical? Laux and Leuz (2010) consider this aspect and conclude that fair-value accounting did not add to the severity of the financial crisis; quite the contrary, it contributed to creating more stability. In addition, if a standardised disclosure framework is in place, containing information about the valuation of sovereign exposures, it would very likely be considered by investors – regardless of the actual accounting treatment chosen by banks. Finally, valuation criteria disregarding market price developments may lead to complacency in bank risk management or allow regulatory arbitrage trades. Requiring banks to ensure that the bulk of their sovereign exposures are classified in accounting categories measured at fair value would be a well justified change, as such assets are typically the most liquid and easiest to price. A final ingredient of the reform would be a mandatory disclosure framework for banks’ sovereign holdings. The EBA already publishes a significant amount of information, but for a limited sample of EU banks, on a voluntary basis and without a robust legal framework. Opaqueness of risk exposures and uncertainty on valuation criteria have been a powerful crisis accelerator. If market participants cannot rely on reliable and comparable information they tend to think the worst of each and every bank, thus penalising also banks that have low exposures and a proper risk management framework in place. In a crisis situation, transparency dispels uncertainty, while at normal times it introduces some elements of market discipline. The EBA transparency exercises also had other positive effects. Bischof and Daske (2013) illustrate the increase in market liquidity generated by EBA-driven disclosure, but also as a consequence of subsequent voluntary disclosures; the decrease in market liquidity during the European debt crisis can be attributed mainly to those banks that did not maintain frequently updated disclosure on sovereign risk, in the absence of a specific regulatory request. Making the EBA transparency exercise, enhanced in its coverage and frequency, a permanent feature of the regulatory framework would therefore be a significant step forward as also argued in Enria (2016). In our assessment, these proposals, if appropriately calibrated, would not lead to disruptive adjustments in bank balance sheets or sovereign debt markets. Nevertheless, a careful impact assessment should be conducted, in order to ensure that any regulatory change considers not only the prudential benefits, but also the possible effects in the pricing and availability of sovereign financing, as well as on the functioning of money markets, including the system of primary dealers, in which banks play a very significant role. The transition to a new regime should be sufficiently gradual, and possibly include an exception for programme countries8)See http://ec.europa.eu/economy_finance/assistance_eu_ms/index_en.htm for a list of the current countries the receive financial assistance in EU member states, so-called programme countries.. The likely attitude of investors to front load the requirements in their calculations and, therefore, the possible implications on a wider financial stability perspective, should also be taken into due account. The proposals could also be implemented in a sequential fashion. A standardised transparency regime and a requirement to widen the scope of mark-to-market valuations could be the right starting point. In fact, the former is already under way, although not embedded in the legislative framework, while the latter would be better finalised under the current low interest rate environment, as it would not imply any significant capital impact. The gradual introduction of a framework that introduces non-zero risk weights and limits concentration risks could then be considered at a later stage, following a careful impact assessment. Acharya, V. V., and Steffen, S. (2015). The “Greatest” Carry Trade Ever? Understanding Eurozone Bank Risks. Journal of Financial Economics, 115 (2), 215-236. Bischof, J., and Daske, H. (2013). Mandatory Disclosure, Voluntary Disclosure, and Stock Market Liquidity: Evidence from the EU Bank Stress Tests. Journal of Accounting Research, 51 (5), 997-1029. Brunnermeier, M. K., Garicano, L., Lane, P., Pagano, M., Reis, R., Santos, T., Van Nieuwerburgh, S., and Vayanos, D. (2011) ESBies: A Realistic Reform of Europe’s Financial Architecture. VoxEU. EBA (2015), Second report on impact assessment for liquidity measures under Article 509(1) of the CRR. Available at: https://www.eba.europa.eu/documents/10180/950548/2014+LCR+IA+report.pdf. Enria, A. (2016). Ensuring transparency in the European financial system. OMFIF City Lecture, May 2016. Available at: http://www.eba.europa.eu/documents/10180/1454310/Andrea+Enria+-+City+Lecture+at+OMFIF%2C%204+May+2016.pdf. ESRB(2015). ESRB report on the regulatory treatment of sovereign exposures. Available at: http://www.esrb.europa.eu/pub/pdf/other/esrbreportregulatorytreatmentsovereignexposures032015.en.pdf?c0cad80cf39a74e20d9d5947c7390df1. Lane, P. R. (2012). The European Sovereign Debt Crisis. Journal of Economic Perspectives, 26(3), 49-68. Laux C., and Leuz C. (2010). Did Fair-Value Accounting Contribute to the Financial Crisis? Journal of Economic Perspectives, 24 (1), 93-118. Shin, H. S. (2009). Reflections on Northern Rock: The Bank Run that Heralded the Global Financial Crisis. Journal of Economic Perspectives, 23(1), 101-119. Taleb, N. T. (2008). The Black Swan: The Impact of the Highly Improbable (Paperback). Penguin Books, 2008. 2. ↑ According to Merriam-Webster, a white elephant is “something that requires a lot of care and money and that gives little profit or enjoyment”. 6. ↑ See for instance EBA (2013b) and EBA (2015) for a description and impact assessment of the LCR metric. 7. ↑ The Capital Accord of July 1988, later known as Basel I, has a number of careful considerations on the matter, but does not clearly articulate the rationale for a zero risk weight, just noting that “individual supervisory authorities should be free to apply either a zero or a low weight to claims on governments”. 8. ↑ See http://ec.europa.eu/economy_finance/assistance_eu_ms/index_en.htm for a list of the current countries the receive financial assistance in EU member states, so-called programme countries.